The Power Pallet is a complete biomass power generation solution that converts dense biomass like wood chips and nut shells into electricity and heat. 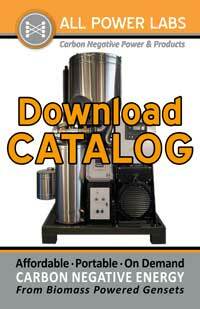 It is a compact, integrated system – from biomass in, to power out – delivered at the newly reduced price under $1.40/watt. 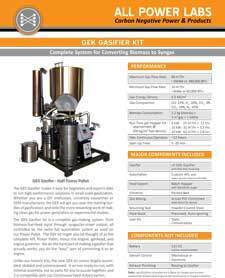 The Power Pallet is comprised of the GEK Hot TOTTI multi-stage gasifier, spark fired industrial engine, generator head, and electronic controller. The system automatically adjusts syngas/air mixture via a wide band Bosch oxygen sensor, shakes the grate when needed, and removes ash via a mechanical auger. The Process Control Unit (PCU) monitors and responds to all internal reactor, filter and engine conditions, displaying the results on an LCD screen. 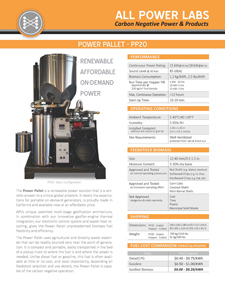 Power Pallet genheads are configurable to single, split or three phase, at 120/208/240Vac, 60hz or 50hz. 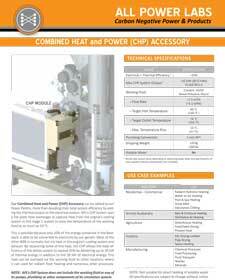 We also offer an optional grid-tie package. 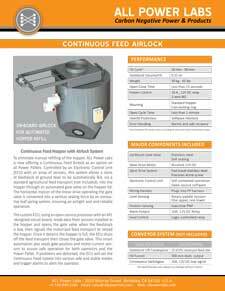 To eliminate manual refilling of the hopper, ALL Power Labs is now offering a Continuous Feed Airlock as an option on all Power Pallets. Controlled by an Electronic Control Unit (ECU) with an array of sensors, this system allows a store of feedstock at ground level to be automatically fed, via a standard agricultural feed transport (not included), into the hopper through an automated gate valve on the hopper lid. The horizontal motion of the linear drive operating the gate valve is converted into a vertical sealing force by an innovative leaf spring system, ensuring an airtight seal and reliable operation. The custom ECU, using an open-source processor with an APL-designed circuit board, reads data from sensors installed in the hopper and opens the gate valve when the feedstock is low, then signals the motorized feed transport to reload the hopper. Once it detects the hopper is full, the ECU shuts off the feed transport then closes the gate valve. This smart automation also reads gate position and motor-current sensors to assure safe operation for both operators and the Power Pallet. If problems are detected, the ECU will set the Continuous Feed system into various safe and stable modes and trigger alarms to alert the operator. Our Combined Heat and Power (CHP) Accessory can be added to our Power Pallets, more than doubling their total system efficiency by adding the thermal output to the electrical output. APL’s CHP System uses a flat plate heat exchanger to capture heat from the engine’s cooling system in this stage 1 system to raise the temperature of the working fluid by as much as 14 °C. This is possible because only 20% of the energy contained in the feedstock is able to be converted to electricity by our genset. Most of the other 80% is normally lost via heat in the engine’s cooling system and exhaust. By recovering some of this heat, the CHP allows the total efficiency of the whole system to exceed 35% by delivering up to 20 kW of thermal energy in addition to the 18 kW of electrical energy. This heat can be pumped via the working fluid to other locations where it can used for radiant floor heating and numerous other processes. 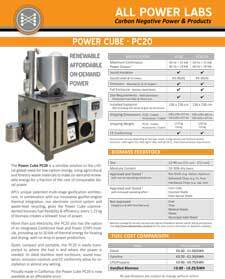 The Power Cube PC20 is a sensible solution to the critical global need for low-carbon energy, using agricultural and forestry waste materials to make on-demand renewable energy for a fraction of the cost of comparable diesel power. APL’s unique patented multi-stage gasification architecture, in combination with our innovative gasifier-engine thermal integration, our electronic control system and waste-heat recycling, gives the Power Cube unprecedented biomass fuel flexibility &amp; efficiency; every 1.15 kg of biomass creates a kilowatt hour of power. More than just electricity, the PC20 also has the option of an integrated Combined Heat and Power (CHP) module, providing up to 30 kW of thermal energy for heating and drying, with no drop in power production. Quiet, compact and portable, the PC20 is easily transported to where the fuel is and where the power is needed. Its sleek stainless steel enclosure, sound insulation, emission controls and CE conformity allow for installation in almost any setting. Proudly made in California, the Power Cube PC20 is expected to be available in 2017. 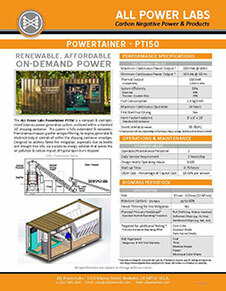 The ALL Power Labs 150kW Powertainer is a compact and cost-optimized biomass power generation system, enclosed within a standard 20’ shipping container. The system is fully automated and complete: from biomass hopper, gasifier and gas filtering, to engine, generator and electrical output control – all within the shipping container envelope. The goal is a total-system-in-a box, drop it off the truck and go – no onsite construction required. The Powertainer was originally developed as part of a US Dept of Energy project with the University of Minnesota, Morris, Cummins Power, and the Diesel Research Lab of U of Minnesota, Twin Cities. On January 23, 2015, All Power Labs received a $2M USD grant from the California Energy Commission to begin work on commercializing the Powertainer. Along with project partners UC Berkeley, Sierra Pacific Industries, and the Placer County Air Pollution Control District, APL will be working to make a modular power plant able to convert forest fire remediation waste into on demand clean energy. Pricing has yet to be determined but we expect deliveries by Q4 2017.